Another single manages to break my usual barrier of shunning them in favour of reviewing full albums thanks to a snazzy cover picture. 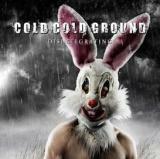 The sinister-looking rabbit reminds me of the ominous snaggletooth of the Donnie Darko-movie, but in fact seems to be a picture of Cold Cold Ground’s guitarist Mr. Bunny. The Finnish band, having worked under this name since 2004, has churned out three EPs prior to their debut album This Side Of Depravity, which was released just under a week ago, this disc being the introductory single. The band’s own description of their musical direction is “Electric Shock Rock with disturbing visuals and energetic live performances”. Put in plain terms, based on these two songs their shock rock consists of a dominant mix of industrial and alternative rock with dashes of raunchier glam rock in there as well. At least half of that description would not be too evident on the title track which is, to be blatantly honest here, one of the most limp-wristed songs I have heard all year. A moody, melancholic mass of keyboards and programmed breathing noises is accompanied by some flaccid strikes of the guitar that just don’t do anything for me. The somewhat wrist-slashing lyrics don’t help things at all. Thankfully singer Hauptmann D stays far away from any emoish whines or such and utilizes a semi-gothic croon which serves the song well for what it is. The “b-side” You Will Break is what saves this band’s impression from total oblivion, as it’s a quite spirited rocker with some hooky keyboards backing the driving guitar riffage. The programmed sounds still aren’t sitting that well with me but at least I feel a lot of effort behind the tune. By some weird way the song actually makes me think of Mötley Crüe’s most modernized material, just with a lot less nasal singer. The most commendable quality here is undoubtedly the production which has all elements very well balanced and punchy. If their full debut album is more in the line of You Will Break, I can see fans of say, Deathstars or Marilyn Manson’s most up-beat material eating it up, but overall, this single leaves me with just cold, cold indifference.